JTS is back again at the home of British motor racing. See all aspects of the Japanese scene from highly modified to top performance cars. An action packed day. 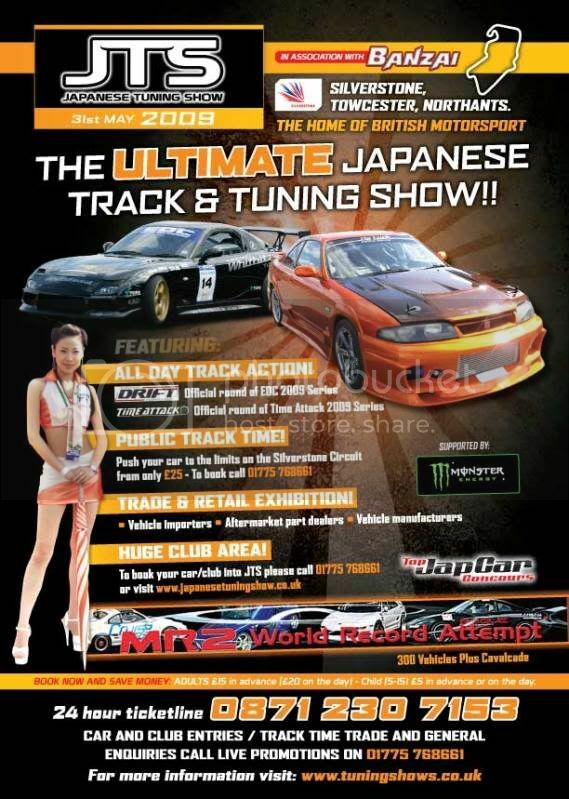 To book in as a club download the form on JTS - Japanese Tuning Show Don’t worry if you cannot make it as a club - you can still show off your Jap car in the individual show car paddock. To book your car in download the club booking form and fill in the individual show car section. If you have any questions please contact us on info@auto-media.co.uk. “The Autoglym Top Jap Car Concours” finals will be held in an elite arena in the heart of the show. To enter your car please email your name, contact telephone number and make and model of the car to info@auto-media.co.uk. You will then receive further instructions about the photo’s and spec details we will need. The closing date for entries is 8 May 2009 and all entries will be put forward to the judging panel, followed by all owners being contacted to advise if they have been successful. Hot off the press: Car club entries will gain free access to the grandstand areas to watch all of the track action. Family fun: Look out for the vouchers in the next two issues of Banzai to gain free entry for up to 3 children with one paying adult! passenger rides and Sumo wrestling suits - any clubs that want to challenge each other let us know!